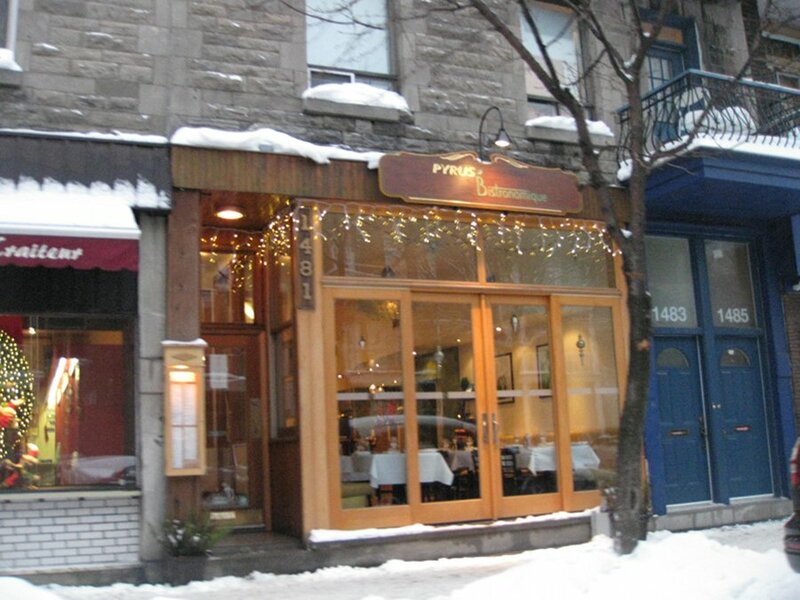 A recent appearance on the Montreal food scene, Pyrus offers us a bistro meets varied European cuisine approach to food. I was tipped off about this by one of my friends who is an even bigger foodie than me; she’s way pickier than I am, so I was curious to see what brunch would be like. I already like the area of Laurier with it nice shops, great little restaurants and quaint little neighbourhood with a great vibe. 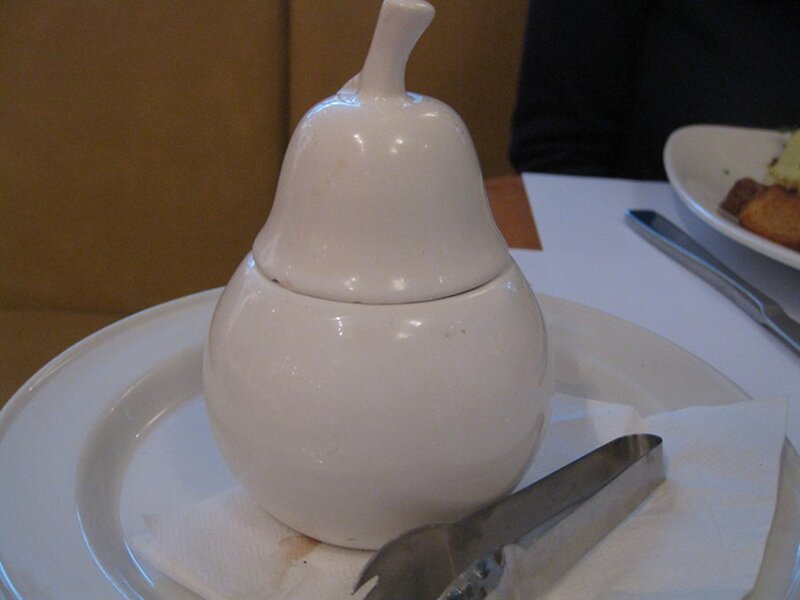 When you walk into Pyrus you notice a pear theme from the art all around all the way to the sugar container (in case you didn’t know Pyrus means pear trees). I really don’t know why they chose that but they did. The interior is very well lit with large windows up from an open kitchen on the side, a large wine cellar in the back and tables all around. They have this cool thing in the kitchen which is used for their ham and some other meats with its skewers going round and round on top of a heat source but not at all like those chicken rotisserie ones you see. When we had ham in our dish it came from this and was amazing. I think it does some kind of slow cooking and I want one for my house now. 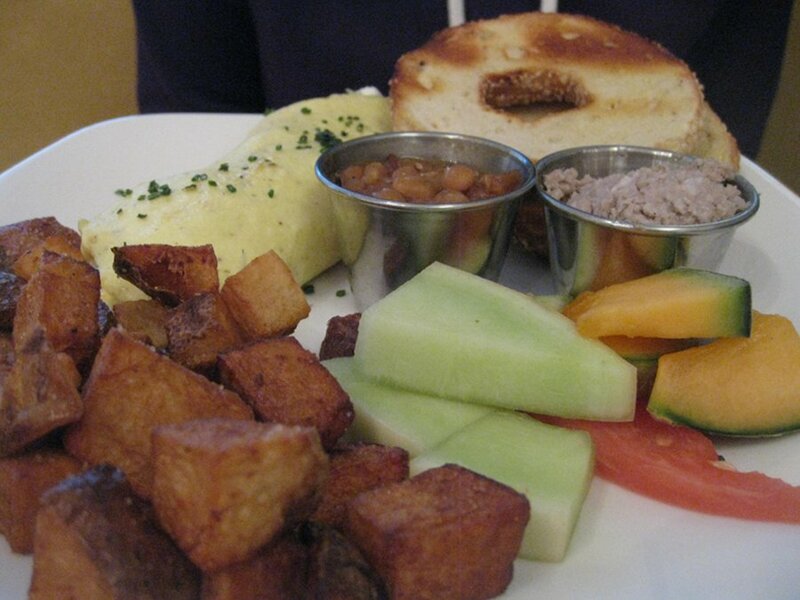 My friend had a chorizo omelette ($14) which came with potatoes, some fruit, cretons, beans and a choice of bagel or bread. Coffee was included in this dish and refills were free. The omelette was rolled and had chorizo bits in it which was a nice touch. The beans had lard in them and a different taste to them as normally beans have that maple syrup taste to them. But, these were not as sugary sweet so it was a nice change. The chorizo bits were very tasty and the omelette was of a fair size. Next came my friend’s dish, which was the most interesting of all of them. 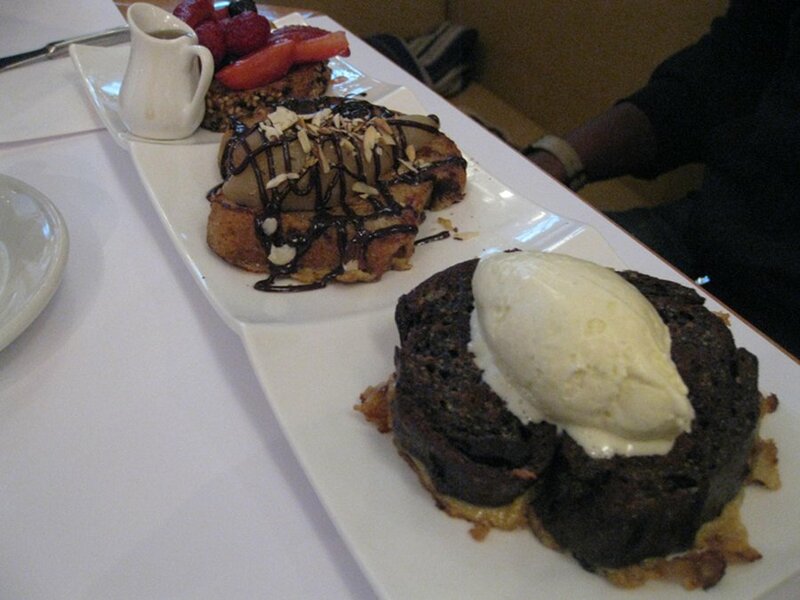 The French toast trio ($15) is three different breads and toppings. The size is not enormous although, the sampling is amazing since each is so very unique. You get one chocolate bread with cranberry and ice cream, then an orange and date bread with chocolate covered pears and lastly was the sesame bread with fruits. The dish came with coffee and free refills just as the others did. In general, $15 is a touch much for French toast but you get three slices of culinary delight and each slice is so different from the other so the trip your taste buds take is well worth the little bit extra. The chocolate bread and ice cream portion is dark and deep in its chocolaty taste; the orange and date bread with pears has a natural sweetness that is outstanding; and the sesame bread with fruit topping is loaded with the sweetness of berry fruits yet offset by the sesame which is not sweet by nature. Needless to say, I loved this dish and wish I ordered it. Overall, the slices are not enormous but the taste is impressive in every possible way. Then came my dish, which was quiche eggs Benedict ($13) – my signature- which is two poached eggs on a small quiche with chorizo bits. It also came with potatoes on the side, beans and some varied fruit pieces. The potatoes were above average but the chorizo was spectacular and of a large size. The quiche was small but was loaded with taste and flavour; I only wish there was more of it. The eggs seemed a little under-salted which is odd since I never felt that before but the dish was very impressive and I was quite satisfied. However, I still wanted just a little bit extra to feed my appetite. Lastly, we had an apple croustade ($8) and it was very tasty and sweet. There were nice chunks of apple with a small cream and syrup on the side. This was a nice accompaniment to a normal dish if someone has a larger appetite. The apples were warm and delightful and since we shared it with three people it was just the right amount making the $8 well worth the splurge. Our waiter was very good as he made some dish suggestions and explained a little about the restaurant at the end of our service when we were chatting. The refills started off slow but were very frequent after the first little bit. They also had a coat check which is pretty cool and useful in those winter months that we love so much. About a third of the menu is vegetarian friendly; the menu is not that long so your options are limited. I liked Pyrus. I felt the dishes were impressive and decently priced when you consider you get lots of sides in your dish as well as coffee included. The location itself, along with the included coffee, demands about a dollar or two extra. 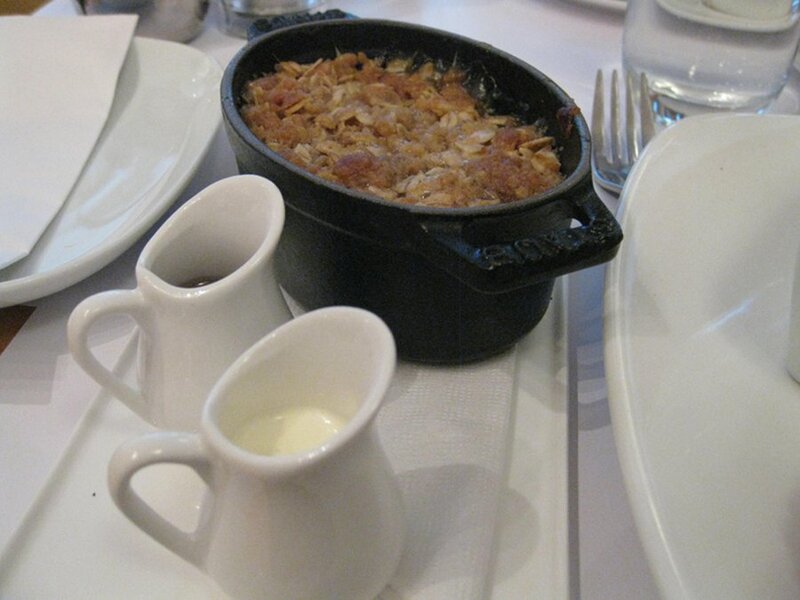 I loved the French toast dish and I am likely to dream about it tonight. I could see this as a nice place to do something with family and friends like maybe a birthday brunch or some sort of similar gathering. If you like refined and creative brunches then you will love Pyrus. 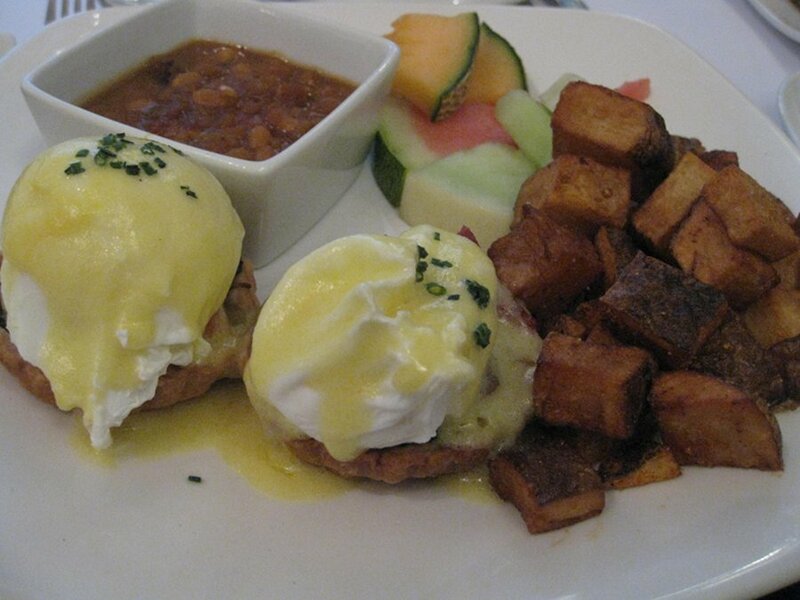 If you love old school classic bacon and eggs brunches, you may not. I do find the portion size is not that enormous but you still do get lots of sides on your plate. I think this is more than enough for most people. I think it’s called Pyrus because the owner’s last name is Poirier. Yes, Pyrus is latin for Poirier. 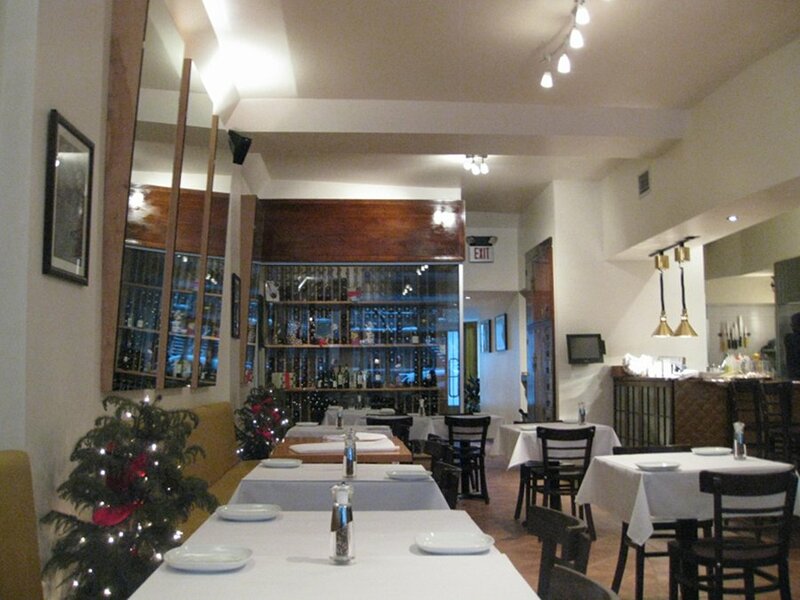 The owner & chef is Renaud Poirier. Poached eggs on quiche? So egg on top of more egg? This place sounds/looks good, think I’ll try it. The food was quite good but the waiter was rude when we spoke English to him. He even pretended he didn’t understand when my friend asked if they took debit card, but answered to me when I said it in French, even though the pronunciation is practically identical. It was simple question pronounced thousands of times in any restaurant around the world. This restaurant advertises ‘le brunch le plus cochon en ville,’ and indeed it is a good mixture of the epicurean and the hearty. I’ve been there several times, and I’m always very happy to go back. Be sure to have a side of either bacon or ham, because their meats are among the very best I’ve had. I would also recommend the smoked salmon and the omelettes. The coffee, too, is excellent. The place is bustling but not especially noisy, and the servers are pleasant and amusing.